Here is a common lawn drainage problem, some detailed photos, and some possible solutions. This was submitted from a homeowner who contacted me regarding drainage issues on his property, and I provided him with some possible solutions. 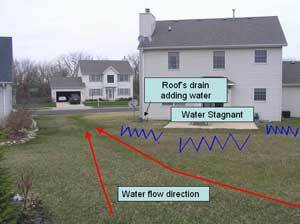 Water flowing towards a house is a common issue and can be a real problem. Water can get into the house...everyone's worst occurrence! 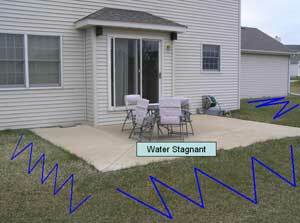 In addition, water can stagnate creating other types of problems. 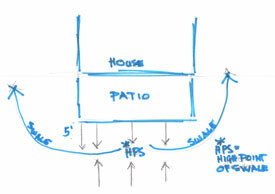 To correct this, it is best if you know what your land elevations are throughout the yard. 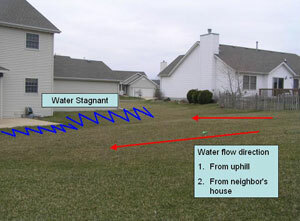 Water flows only along land that is pitched and all land should be graded properly. There are certain procedures to follow, and if you do this, your lawn drainage issues should be solved. The issue here, which I see quite often, is that the ground surrounding the patio is flat and does not drain anywhere. It just sits there! The following are both my explanations and suggestions. There are a couple of ways to solve this drainage problem. You must pull the soil around your patio back towards the hill for a minimum of 5 feet, and grade it at 1/4 of an inch per foot away from the patio. This means that the area five feet out (or more) will be lower than the patio area and water will drain in that direction (away from the patio). The area is currently flat and will have to be re-graded in this way. A drainage swale could be created to correct the lawn drainage problem. A swale is a like a gentle ditch which is a foot or more wide. It is pitched so that the water will travel from the higher elevations to lower points. This swale has to lead the water somewhere. It seems logical to lead the swale around the house on both sides. I would create the high point of the swale at your patio (5 feet out), and have separate swales leading the water around each side of your home, emptying into the storm drain on one side. I am not sure what is on the other side. All land along the rear and sides of your house has to be graded away from your house also to work with the grade of the swales. In order for the swales to fix your lawn drainage problem, the elevation at your patio must be higher than the storm drain at the street. In addition, there must be 1/4 of an inch per foot difference when calculated along the swale between the high point of the swale and the storm drain entry point. So if the distance is 100 feet from the high point of the swale to the storm drain, for example, the difference in elevation must be around two feet...two feet higher at the patio than the storm drain. But let's say this is very difficult to accomplish due to your existing grades. What if this is impossible? There is another option. That would be to install a perforated pipe wrapped in filter fabric and covered with decorative or crushed stone at the perimeter of your patio. Thus, all water leading to the patio will enter into this pipe. A swale would not be created. This pipe should connect to under ground solid pvc pipe and lead around the side of your house. Then...if your town will allow it, lead the pipe into the storm drain. (I am not sure what is happening on the other side.) If this is not allowed, you can install a drainage pit. This looks like a large drum, but has holes in it for water to percolate out. It is placed under ground. The pipes then lead into the drainage pit. These are rough concepts and really all your existing elevations need to be known for it to be designed accurately. This was very poor land planning and I am surprised whoever did it received approvals.